Pretty Opulent: Revlon Colorstay or Revlon Photoready? Revlon Colorstay or Revlon Photoready? 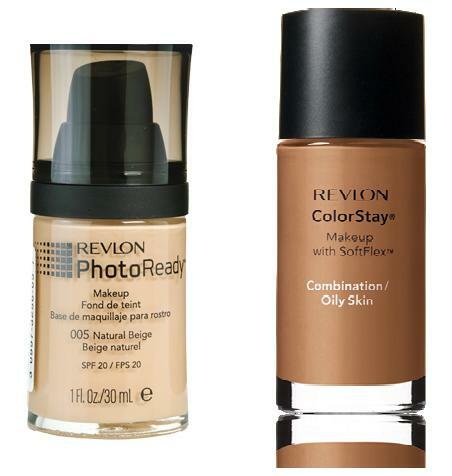 Revlon Colorstay has been a cult favorite for years now...people like gossmakeupartist on Youtube rave about it as being one of the BEST drugstore foundations. I'm dying to try it, although I haven't yet because I still have my Rimmel Lasting Finish 25 Hour which is like a good "everyday" foundation. When that runs out perhaps, I will give it a go! Although I like my Rimmel one, it tends to feel a bit heavy and I was looking for something better -yet still in the drugstore price range. I really only like to break out the MAC Matchmaster on weekends or special occasions - just because it's pricey and yes, I'm cheap like that. 3. Did I mention, it comes with a pump? To my disappointment, Revlon Colorstay does NOT come with a built in pump, it is prehistoric and has an open mouth bottle that you pour out into your hand or sponge and apply on face. So...maybe I'll get it when Revlon gets with 2013 and puts a pump on it! I'm not a sponge person, I like to use brushes and don't like to use my hand. So please put a pump in it! 1. Feels light and airy! (Hate cakey, sticky, dewy FEELING foundation)! 2. Airbrush finish. Now, the brush you use to apply it WILL affect the outcome, so do apply with a MAC skunk brush or Real Technique's Buffing Brush found in their Core Collection set. 3. Gives a nice glow - looks youthful. 6. Removes easily. With Rev. Colorstay I read it's a bit difficult to remove. 1. Light coverage - along with feeling light an airy, you will find it actually IS light. MUST USE CONCEALER for dark spots/acne scars. 2. Not for very oily skin - Not a personal complaint of mine, but many have said it emphasizes their oily skin. Remedy? Set with loose/pressed powder - and TAP IN powder using a flat head brush. 3. Shimmer - yes it has a bit of shimmer in it - another con that I see - but it doesn't bother me personally. 4. Not long lasting. Put on in the morning and unless you make it completely bullet proof with powder, it will fade away in 8-10 hours. Less if you live in a humid climate. Those are a few cons I found, I'd have to live with it longer to come up with a few more pro's and cons...but over all I'm completely happy with my purchase...this will definitely be used a lot in the coming weeks and months. Looks great with contouring...looks like skin...very pleased customer here! If you tried them both, make sure you comment below!